Mike Talor, FDA deputy commissioner for foods and veteranary medicine engages in a lively discussion with Pooh Sprague, owner of Edgewater Farm in Plainfield, N.H., on proposed changes to FDA regulations that could prove expensive to smaller scale farmers such as Sprauge during a tour at Edgewater Farm on August 20, 2013. 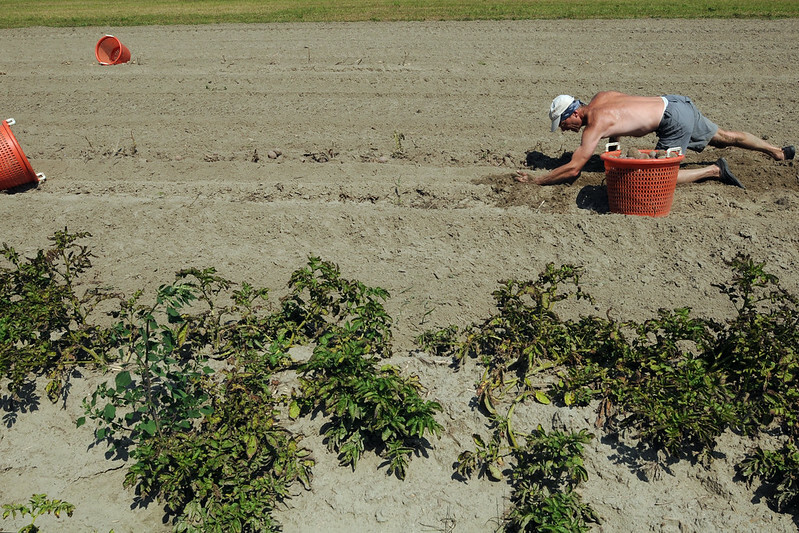 Michael Bald of Royalton harvests Purple Viking Potatoes at Hurricane Flats Farm in South Royalton, Vt., on August 19, 2013. Bald, who works part time at the farm, says harvesting one row of potatoes can take several hours, "I just try to focus on my task and not look up at what I still have to do," said Bald. After a shortage of shorts assignments this summer, I'm back to evenings of warmups and drills of football and soccer and field hockey. 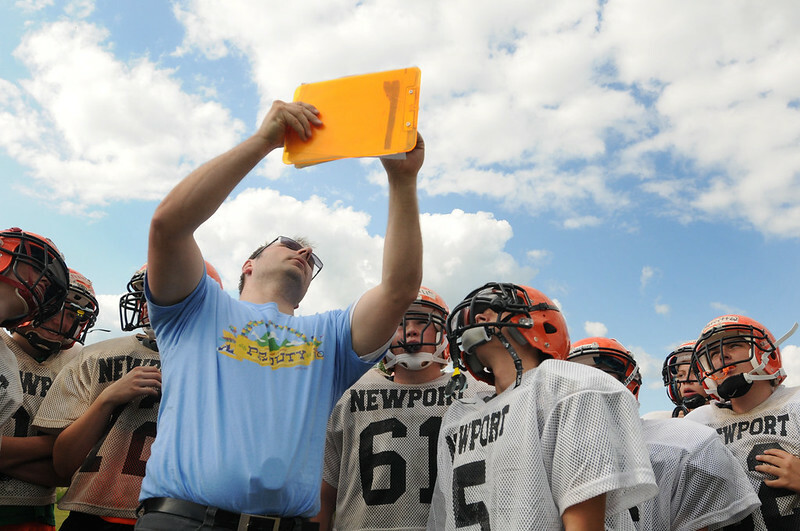 Soccer is the definite favorite, but I enjoyed photographing Newport High School's football practice last week. 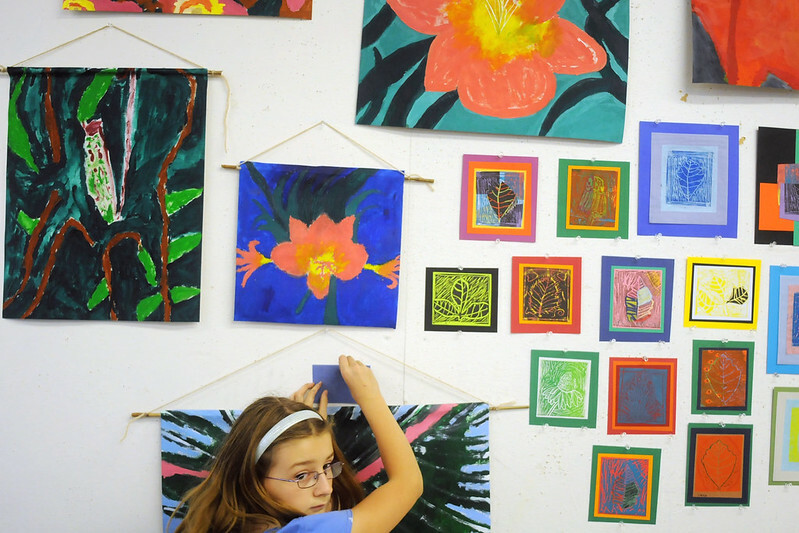 Caitlyn Ryan, 9, of Lebanon, hangs a tag over her painting of a leaf to prepare for a gallery show at the end of the two week Micro/ Macro Class at the AVA Gallery in Lebanon, N.H., on August 9, 2013. The class, which was offered for grade-school students as well as teenagers, partnered with Dartmouth to view flora and fauna through microscopes and create art based on what they saw. 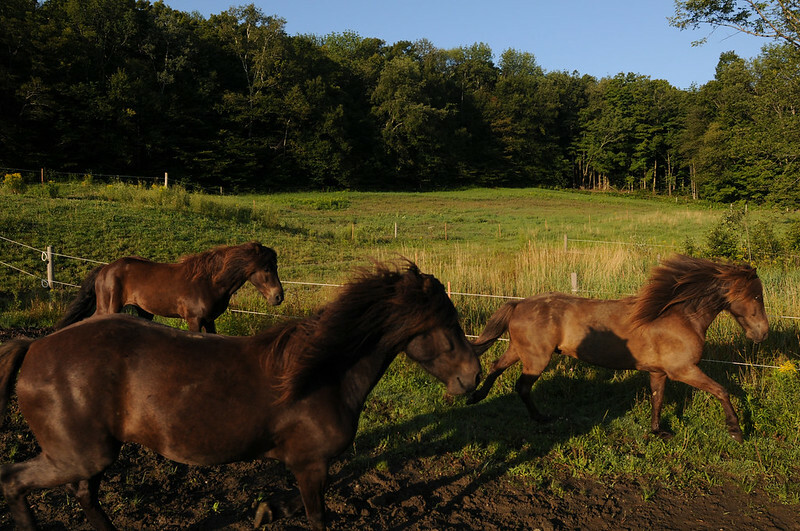 I've been working with Silver Maple Icelandic Horse Farm to update their website. 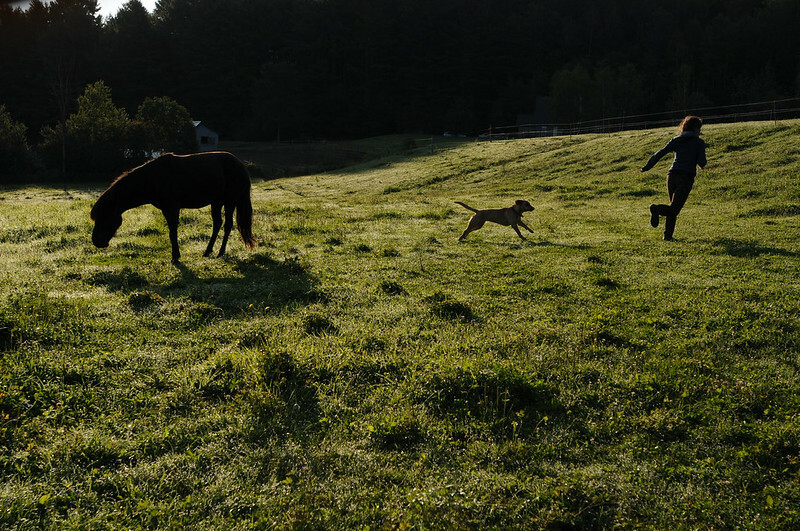 Last week I photographed the farm's two interns, Quinn and Bailey, completing their morning chores. I've written a few articles for the Valley News before, mostly small end of year reflections that accompany my favorite photograph from the year, and whatnot. I volunteered to participate in a yearly summer series in the paper, entitled "Summer Journeys," where a writer reflects on an activity or trip they recently participated in. While writing definitely doesn't come as easy as the photography (I did both for this story), I learned a lot, and I think I would do it again. Every year, I find myself picking up at least a few new habits or hobbies to add variety to predictable seasons. I dabbled in tree skiing (skiing off groomed slopes) last winter, planted a garden this spring, and started listening to baseball games on the radio this summer. Some of these turn into obsessions, such as the quest to find as many swimming holes as possible last summer, which consumed many weekends and after-work hours. I found my newest obsession a few Sundays ago, when my husband Jeff and I were driving through Hartland, looking for a new swimming hole to try out. Jeff, a timber framer and tree lover, mentioned that he had heard that Vermont’s largest black walnut was somewhere in Hartland. Not considering that Hartland consists of 45 square miles, or the good possibility that this tree would be growing nowhere near roads, we veered onto the nearest dirt road and started rubbernecking. After 15 minutes of not finding a single black walnut, I Googled “largest black walnut in Vermont.” This quickly led me to the Vermont Big Tree List, with current information on the size and location of the largest example of each tree species in Vermont. (Trunk circumference, height and crown spread are all considered in the rankings.) It didn’t give an address, but narrowed down our search to North Hartland. As we drove on Route 5 North, looking for side roads to head down, we saw it. It was impossible to miss. Standing about 20 feet away from Route 5, the tree dwarfed the house and car dealership it grew between, the branches reaching to enclose the distance between both buildings. Few trees grew near it, allowing it to become a champion. Giddy at so easily completing a search that we thought would be time consuming or downright impossible, we jumped out of the car, gaping at the giant like we were tree tourists, photographing each other next to the massive trunk. Soon after, we started talking about the next giant tree to find. A quick perusal of the Vermont Big Tree list revealed a treasure trove all in one town — Woodstock. 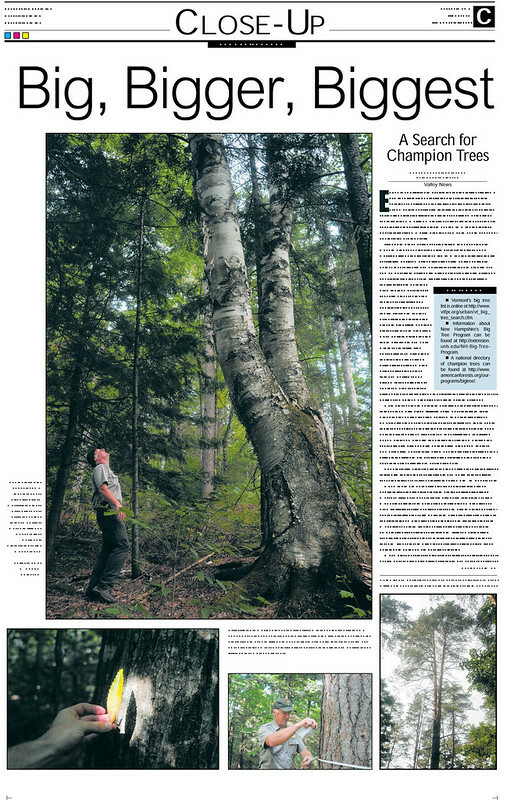 Knowing we wouldn’t be so lucky as to find the next big tree on the side of a main road, I called the Marsh-Billings-Rockefeller National Historic Park in Woodstock to ask whether any of the champion trees grew in its forest. They transferred me to Kyle Jones, an ecologist at the park, who told me that not just one, but four state champion trees can be seen within the park. When I asked him the exact locations, he chuckled. “One of the trees is easy to find — it grows right in front of our carriage barn visitor center, but the other three … those are my job security trees, since I’m the only one who knows where they are.” We met Jones in front of the visitor center the next day, where not one, but four large Norway spruce trees of almost equal width and height surround the entrance. After making our introductions, he pointed out that the largest of the four, which wasn’t the tallest, but had more of a branch spread and a thicker trunk. 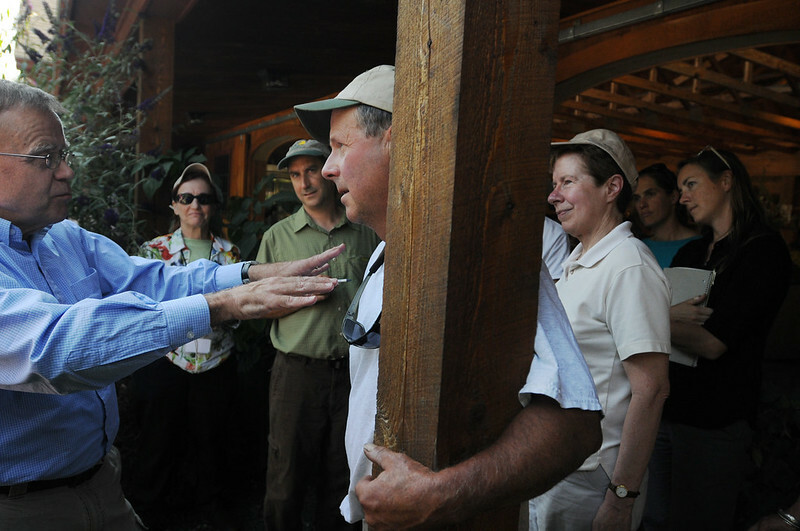 “We have the second- and third-largest Norway spruce here, all growing in one spot,” said Jones. We piled in Jones’ car to drive to the Prosper Road entrance of the park, where we would take a hike to view the three other champions. On the drive, we learned that Jones was the only park employee to know the locations because he was the one who found the trees, measured them and alerted Windsor County Tree Warden Jon Boutin. Jones and Boutin hike to the tree in question, measure the diameter, length and crown spread (how wide the branches spread). It isn’t always easy, since most trees are perched on hillsides, surrounded by undergrowth. We found our second goliath after only a few minutes of walking, veering off the path to a grove of reddish-brown Scotch Pines. The central tree rose many feet above the rest, like a king surrounded by courtiers. Unlike many big trees, Jones explained as we continued our walk, the ones at Billings are comparatively young, planted in the late 1800s and early 1900s. Thousands of pine, spruce, hemlock and European larch, among others, were planted by the Billings family to reclaim forests that had been stripped by grazing sheep. With no trees to compete against for water and sunlight, the seedlings had everything going for them to grow straight, tall and wide — perfect champion material. The next tree we found, after 10 more minutes of walking, was considered a misfit: a naturally grown paper birch within a forest of planned coniferous trees. Its wide, lumpy trunk distinguished it from the skinny, straight birches I’ve seen. It was an unusual and big tree for sure, but Jones wasn’t sure if it topped the list anymore. He emailed me later to let me know he’d checked with Boutin, and it had been bumped off the list by a birch in Wyndham County. Too bad! After we visited our last big tree, a red pine, nestled far off the path in the deep woods, we thought our tree safari was finished, until Jones offhandedly mentioned an American chestnut he had found growing close to a trail this past winter. Chestnuts, Jeff explained to me a few months ago, aren’t just “any other tree.” American chestnuts are a dying species, their near extinction brought on by the chestnut blight, a fungus imported from Japan in the early 1900s. While American chestnuts used to be both massive in size and widespread in number, and used in home building, barns and furniture, these days it’s rare to see one mature from a seedling. Though we had plans for other places to be soon, we discarded them and excitedly took one last jaunt through the woods with Jones to find the chestnut. Scattered spiky seed shells let us know we were getting close. “I should’ve found this tree a lot sooner,” said Jones, “especially since there are these shells everywhere around the tree.” The chestnut, surrounded by maples, was nowhere near the size of the champion trees we had found that day, but Jeff and I both agreed that it was our favorite that we had found in our journey through the park. While the blight will likely ensure that the tree will never reach the size of its ancestors, it’s a feat in itself that the tree has gotten this large, which makes it a champion anyways.